Where most “stadium cost” charts just rely on self-reporting by teams, Harvard researcher Long has actually attempted to calculate the public and private costs of every major-league stadium and arena in North America, including hidden subsidies like free land, lease breaks, and tax exemptions. Long is currently working on a book on this subject (UPDATE: it’s out! ); until then, these archives of her research are the best source for complete cost information. Compiled by the National Sports Law Institute at Marquette Law School. Only broad overviews are provided, but still the best place to start if you want to see how much a team pays in annual rent, say, or who’s responsible for covering venue operating costs. 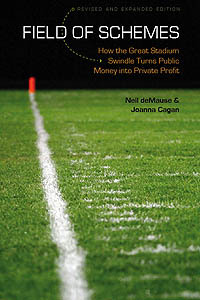 Dennis Coates and Brad Humphreys’ 2000 study finding that when sports teams stop play because of a labor dispute, there’s no measurable impact on cities’ per-capita income. Robert Baade, Robert Baumann, and Victor Matheson’s 2006 study finding that sales tax receipts are likewise unaffected when local sports teams shut down. Geoffrey Propheter’s 2012 study of cities with NBA arenas, finding that neither the presence of a team nor of a new arena has any impact on personal income in a region. Victor Matheson’s 2009 literature review of Super Bowl impact studies, finding the effect of the game to be far less than NFL claims. Detailed estimates of the public/private costs shares of the New York Yankees and Mets stadiums opening in April 2009, calculated by Neil deMause based on public sources. An excellent source of stats on everything from ticket prices to player salaries. Histories and links to articles on every stadium and arena, past, present, and future. Mostly valuable for its list of naming-rights deals, updated regularly. Photo galleries of dozens of current and former sports facilities.